Good Friday represents the darkness that comes before the light; the suffering that comes before the hope; the price that was paid for freedom. As this Good Friday unfolds, here is a reflection and prayer: that Jesus would look at you. Here is what I mean. Right before the agonizing encounter that Jesus had in the Garden of Gethsemane (see last post) Jesus tells his disciples that his time is near. He will die soon. But before he does, he shares even more depressing news with the disciples. He lets them know that when the heat gets turned up and the moment is greatest, every one of them will fall away. He is even more specific with Peter. Not only will he fall away like the rest of them, but Peter is warned that evil and darkness are going to target him specifically. Peter’s response? He shouts, “Never!” He puffs out his chest and says that he would die before he would ever disown Jesus. Failure is not an option. Yet we know what happens next. Three times someone asks Peter if he knows Jesus, and three times he denies Jesus. When his chance to shine comes, he utterly fails. His weakness and false bravado are completely exposed. What is amazing to me is what happens at the moment of Peter’s greatest failure. Surely he would have been aware of it without any help from Jesus. Yet Luke tells us that his weakest moment – at the moment of his greatest failure – Jesus looks directly at him. 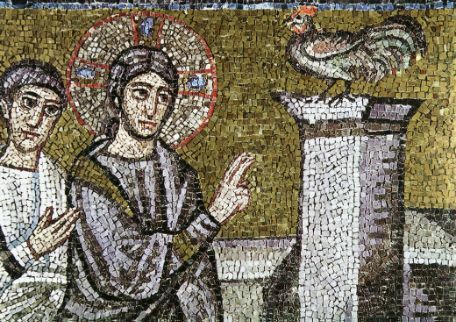 He is sure that the memory of denying Jesus is etched into Peter’s mind and conscience. Why did Jesus look straight at Peter as he was failing this important test? Because Jesus wanted Peter to understand the entirety of the Gospel. He wanted Peter to understand that he was far more wicked than he was willing to admit, and far more loved than he dared imagine. When Jesus looked at Peter in the midst of his failure, it reminded Peter that he was not nearly as strong as he thought. It would not ultimately be his ability, his skills, his maturity, or his morality that would carry him in life or in ministry. To rely on his own strength would lead to utter failure. On the other hand, when Jesus looked at Peter in the midst of his failure, it showed him how immensely loved he was. Most of us struggle to believe God loves us this way when we are at our best. But when we are at our worst? That is difficult to conceive. Yet this is just what Jesus did. This look reminded Peter that Jesus always knew Peter would fail him – just as Jesus knows you and I will fail him – and he went to the Cross for him anyway. He showed how immense and profound his love was. This is the kind of love that changes a person’s life. May you experience the gift of Jesus looking at you this Good Friday. May it remind you that you are more wicked than you ever dared admit – and that only a Crucified Savior can pull you from the darkness that lurks. May it remind you that you are unbelievably loved – that Jesus would go to the ends of the earth or hell itself if it meant you living from that love. That is what Good Friday is all about.